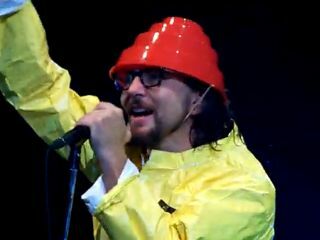 VIDEO: Pearl Jam as Devo? Believe it! We know...you still think of Pearl Jam as that uber-serious, non-party band. Certainly not the kind of jokesters who'd dress up like Devo, right? At the conclusion of the group's 41-song, three-hour-and-35-minute set(!) last weekend at the Wachovia Spectrum in Philadelphia - the last show at the famed venue - Pearl Jam, in full Halloween mode, came out for their second encore dressed in Devo attire and busted out a note-perfect cover of Whip It. Check out the video below. You'll never see Pearl Jam the same way again. And is that a rare Gibson Moderne in the hands of Mike McCready? Somebody call Billy Gibbons!